ET Cloud is Responsive Hosting Joomla template that targets for hosting companies, hosting equipment and services, etc. The Joomla Hosting Template based on Bootstrap CSS grid layout, Quix Page Builder for layout, Shortcode for presenting content easily, Support Font Awesome and K2 extended style. And it created a clean and stylish hosting website that demonstrates reliability and safety for your service. 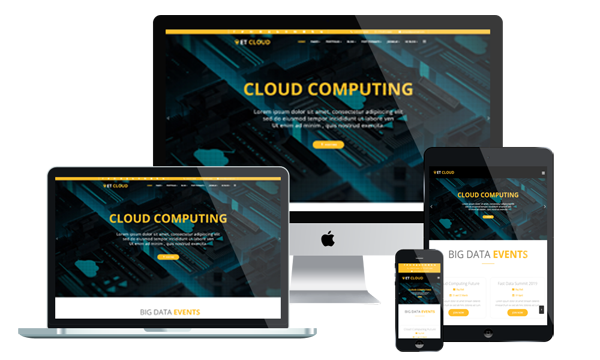 Our team of designers & developers put all their knowledge, enthusiasm and imagination to make the Cloud Website Template user-friendly, well-structured and beautiful. Make use of the template’s blog functionality to bring your clients the latest in hosting solutions, backed up with navigation features like back to top buttons and advanced search. They have chosen minimalist style and balanced color scheme so that your company’s image conveys sense of trust and stability. 100% responsive design of these designs will ensure your online project will render well on screens of any sizes and resolutions. As you see, our Joomla Hosting Template provide endless possibilities to promote your company. All it takes is to select the best items!